Eric Hugenberg works as an Animal Care Assistant at The Mayhew Animal Home in London. Established in 1886, it is one of the busiest rescue centres in London, helping dogs, cats, rabbits and other animals find a new and loving home. Here, Eric tells us all about life as an Animal Care Assistant. My current job title is Animal Care Assistant (Kennels) and I work directly with the dogs in The Mayhew Animal Home’s kennels. I carry out routine duties such as cleaning kennels, walking the dogs and feeding them. In addition, I am involved with training the dogs (as required), grooming, administering basic medical care, as well as occasionally introducing dogs to potential adopters. I have always loved animals, from pets to wildlife, but when I grew up, working with animals meant either becoming a vet or running a pet shop. So, my working life took me along a different path and I ended up working in local government. After turning 40 and having spent 14 years in an office environment, I decided a major change was in order and to look for a job, which I could feel passionate about – working with animals. I realised that my CV, as it was, would not enable me to find a position in the animal care field. Fortunately, I came across the Level 2 Work-based Animal Care course at The Mayhew Animal Home, run in conjunction with The College of Animal Welfare. I completed the Level 2 Work-based Animal Care course. As this course is work-based, it makes it relevant to my job. 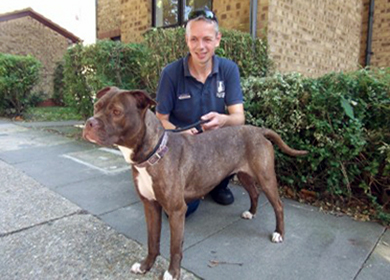 It involved working 3 days a week at The Mayhew Animal Home and an assessor would visit every 4-6 weeks. My assessor would look through my course work, ask for further evidence, and carry out observations, such as watching me feed the dogs and cats, exercise a dog or clean a cat cabin. Since working for The Mayhew Animal Home, I have also completed a distance learning course in Canine Nutrition and a day-course in Animal First Aid. The contact with the dogs. Seeing a new arrival settling in and coming out of his or her shell over a few days or weeks is a very heart-warming experience. At the same time, it is those dogs, which are more difficult to handle, which teach me the most. I am constantly learning new things from dog behaviour to training methods and how my body language and voice can make a difference. Working in a rescue centre I have seen a number of severely abused or neglected dogs arrive here. It is hard to imagine how someone can let their dog starve or not treat a skin condition, which could be controlled with a simple monthly flea treatment, to get so bad that the dog ends up bald with seeping and bleeding sores on his or her body. To learn more things! I really enjoy learning on the job but also realise that a structured course can provide more in-depth knowledge, as well as adding a qualification. Be realistic - animal care is hard physical work, it does involve a lot of routine (especially cleaning!) and can be emotionally demanding when dealing with neglected animals. The rewards, though, are wonderful; to see an animal recover and go to a new home is great. If you’re not sure whether this is for you then volunteer at a rescue centre for a while. If you then decide that you do want to go into the industry, consider doing a work-based animal care course; it covers a wide range of aspects of the job, it draws your attention to things you may not have considered before, and the qualification at the end of the course is truly relevant to the work you want to do. Take a look at work-based animal care courses at The College of Animal Welfare.